To all ADD supporters: round-up of roadshow meetings – and call to arms for 11 December! ADD UPDATE, 2 December 2017: Many thanks to all who came to the ADD roadshow over the last three weeks. Over 400 people came along. The points raised and questions asked are really helping us to prepare for the Eastleigh Borough Council (EBC) meeting on Monday 11 December at the Hilton at the Ageas where councillors will consider the draft Local Plan, namely proposals for 5,200 new houses and a new link road north of Bishopstoke and Fair Oak. 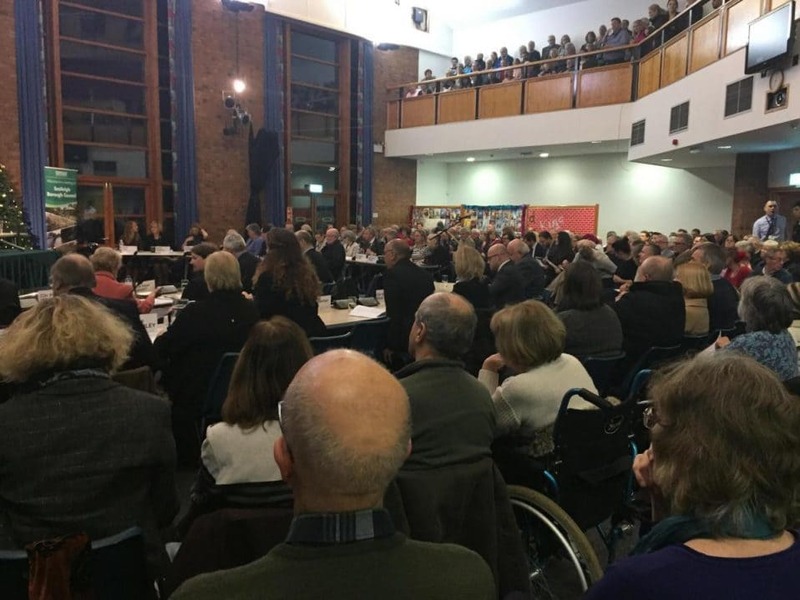 The 11 December meeting is critical – it is so important that councillors grasp how much their decision will impact us and that they take that decision in public. Please do join us there (7pm at the Hilton at the Ageas Bowl, SO30 3XH) – and get in touch if you need a lift or are able to offer a lift. There is masses of parking, so don’t let that put you off! We need to at least double the number of people who came to a similar meeting last year, which had a significant impact on EBC decision-making (see above). In Colden Common, John Lauwerys (Brambridge) and Kate Beal Blyth (Highbridge) were joined by Winchester City Council (WCC) councillors Richard Izard and Sue Cooke. The impacts on Colden Common of around 26,000 extra daily car journeys were discussed alongside the impact on Highbridge of having the North Bishopstoke Link Road built through the hamlet. Richard and Sue explained that Winchester City Council, not EBC, would be the planning authority for that stretch. There is a Duty to Cooperate between EBC and WCC, but WCC have been disappointed by EBC’s lack of engagement. In Bishopstoke, residents Rob Byrne and Gin Tidridge focused on the impacts on Stoke Park Woods and the two Sites of Ancient Woodland managed by the Woodland Trust. With a gap of just 120 metres between Crowdhill Copse and Upper Barn Copse, the Trust are extremely concerned about building the new major road in that gap – they are clear that it will be damaging. EBC themselves describe the gap as being of great importance to the borough’s biodiversity in a report in 2002. The Forestry Commission have told EBC that the gap north of Stoke Park Woods would need to be of a magnitude of hectares, not metres, and that current development has been damaging. In Fair Oak, resident Helen Rees explained how concerned she was about the extra traffic, especially as EBC have not completed proper traffic modelling yet. Losing miles of footpaths and trails through what is now beautiful countryside will impact quality of life in Fair Oak as the conurbation becomes so large. Concern about flooding was raised; as the attenuation ponds at Crowdhill Green have demonstrated, developers do not always get their hydrological calculations right. Crowdhill Green also demonstrates how the new housing will not help local youngsters. Only 35% of the housing will be “affordable” – low compared to other authorities – and developers frequently negotiate a lower proportion, especially when they are required to contribute to infrastructure projects like an expensive new road. Positioning close to Winchester will mean high prices too. In Boyatt Wood, Allbrook resident Dave Betts showed how the North Bishopstoke Link Road will split Allbrook village in two, from the A335 link to the M3 to the B335 at the mini roundabout at Pitmore Lane. Impact on wildlife, including bats and the Southern Damselfly, is of great concern. The River Itchen is of global ecological importance as a chalk stream, hence its protected status. Building the road and the ensuing heavy traffic risks polluting the river, its tributaries and water meadows. The plans for the road do not include replacing the Allbrook Arch railway bridge that is only 3.7 metres high – too low for large HGVs that will still have to travel through central Eastleigh. The Bishop’s Waltham Society invited ADD to speak to members on 1 December. Upham resident David Ashe talked about the impact on the South Downs National Park (SDNP) of having the new conurbation sprawling up to its border, and about the traffic impact on the SDNP’s lanes and villages. Commuters will use the fastest route they can, and that will not always mean using the new road. At all the meetings, concern was expressed about building a car-dependent major housing development so far from infrastructure. If you were unable to raise a point at one of the meetings, or have concerns you would like ADD to consider, do please get in touch via our email: [email protected]. We’d also love to hear about any fundraising ideas you may have. Thanks again for helping us shape our preparations for the EBC meeting on Monday 11 December. We look forward to seeing you there! Your ticket for the: To all ADD supporters: round-up of roadshow meetings – and call to arms for 11 December!